Burns can be minor medical problems or life-threatening emergencies. Many people die each year from fire-related burn injuries. Electricity and chemicals also cause severe burns. Scalding liquids are the most common cause of burns in children. 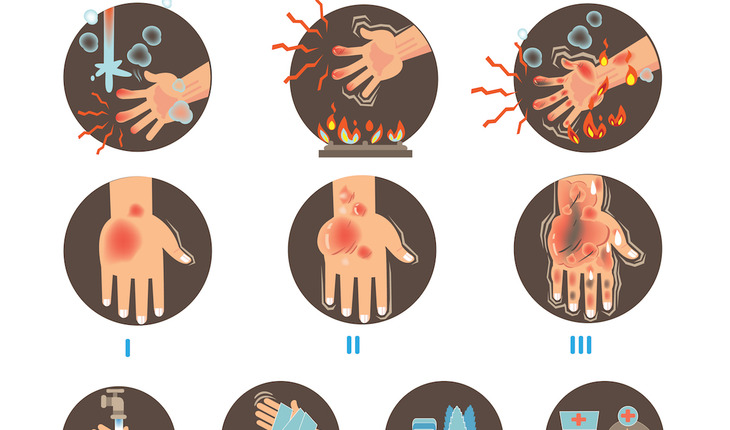 Treatment of burns depends on the location and severity of the injury. Sunburns and small scalds can usually be treated at home. Deep or widespread burns need immediate medical attention. People with severe burns often require treatment at specialized burn centers. They may need skin grafts to cover large wounds or to minimize scarring with deep wounds. And they may need emotional support and months of follow-up care, such as physical therapy. Cool the burn. Run cool (not cold) tap water over the burn for 10 to 15 minutes or until the pain eases. Or apply a clean towel dampened with cool tap water. Don’t use ice. Putting ice directly on a burn can cause further damage to the tissue. Remove rings or other tight items from the burned area.Try to do this quickly and gently, before the area swells. Don’t break small blisters (no bigger than your little fingernail). If blisters break, gently clean the area with mild soap and water, apply an antibiotic ointment, and cover it with a nonstick gauze bandage. Apply moisturizer or aloe vera lotion or gel. This may soothe the area and prevent dryness as the wound heals. If needed, take an over-the-counter pain reliever.Nonprescription products include ibuprofen (Advil, Motrin IB, others), naproxen (Aleve) and acetaminophen (Tylenol, others). Consider a tetanus shot. Make sure that your tetanus booster is up to date. Doctors recommend people get a tetanus shot at least every 10 years. Whether your burn was minor or serious, use sunscreen and moisturizer regularly once the wound is healed. The Mayo Clinic Book of Home Remedies provides answers you need to take care of common health problems on your own. This reference covers 120 of today’s common health problems in an easy-to-follow, A-to-Z format. Learn what you can do for yourself and when to seek medical attention.